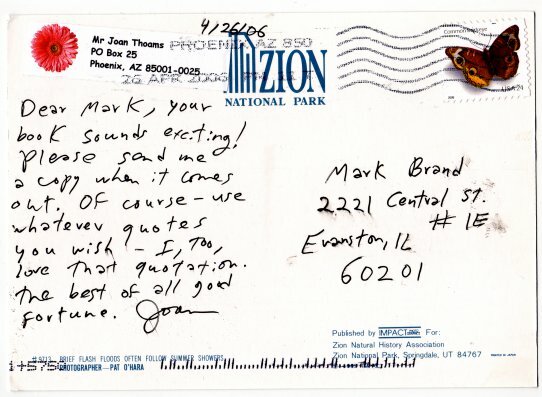 I recieved a postcard in the mail yesterday from Joan Thomas, widow of Ammon Hennacy, a famous socialist/anarchist whom I quoted in the epigraph of Red Ivy Afternoon. She was gracious enough not only to allow me to use the quote, but also sent me a hand-written letter in return. Given that her late husband would be 113 years old if he were alive today, I am thankful there was anyone left to write to at all.